At the time of ‘contact’ (Captain Cook’s arrival (1778,)) the Hawaiian Islands were divided into four kingdoms: (1) the island of Hawaiʻi under the rule of Kalaniʻōpuʻu, who also had possession of the Hāna district of east Maui; (2) Maui (except the Hāna district,) Molokaʻi, Lānaʻi and Kahoʻolawe, ruled by Kahekili; (3) Oʻahu, under the rule of Kahahana; and (4) Kauaʻi and Niʻihau, Kamakahelei was ruler. Then, in 1782, Kamehameha started his conquest to rule the Islands. After a struggle of more than ten years, in 1791, Kamehameha succeeded in securing the supreme authority over the island of Hawaiʻi. In 1790, American fur trader Simon Metcalf of the ship Eleanora flogged Kameʻeiamoku when he boarded his ship. Metcalf later sailed to Maui and, in retaliation to Hawaiians stealing a skiff, he fired his cannons on the villagers of Olowalu. Kameʻeiamoku vowed to attack the next American ship to appear; it ended up being the Fair American, captained by Thomas Metcalf, the son of Simon. The lone survivor was Isaac Davis. Later, the Eleanora returned to the Island of Hawaiʻi and John Young went ashore and was abandoned by Simon Metcalf. Young and Davis would both become military advisors and translators for Kamehameha and fought alongside Kamehameha and his Kona Uncles. 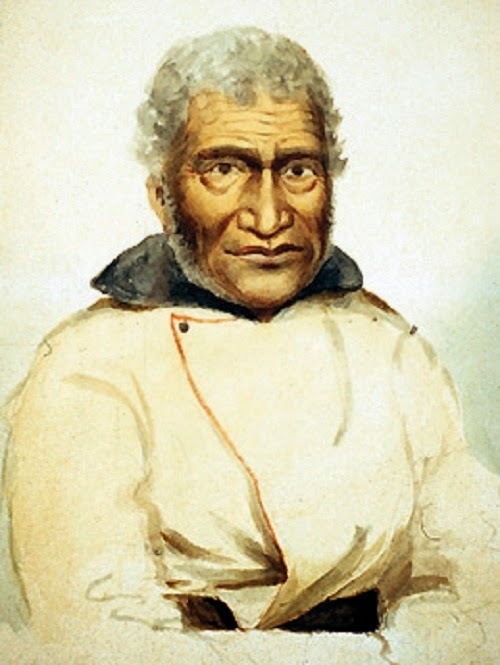 Kameʻeiamoku’s grandson shared the same name as Kameʻeiamoku’s twin, Kamanawa. The grandson Kamanawa and Kamokuiki were parents of Caesar Kapaʻakea. In 1835, Caesar married the High Chiefess Analeʻa Keohokālole; they had several children. Most notable were a son, who on February 13, 1874 became King Kalākaua, and a daughter, who on January 29, 1891 became Queen Liliʻuokalani. Grandson Kamanawa had one other notable claim; he was the first to be charged and hanged under Hawaiʻi’s first modern criminal laws for poisoning his wife in 1840. Kameʻeiamoku’s twin brother Kamanawa also served Kamehameha well. Late in 1790, Kamehameha sent an emissary to the famous kahuna (priest, soothsayer,) Kapoukahi, to determine how Kamehameha could conquer all of the island of Hawaiʻi. Fishers generally refer to it as ‘Red Hill;’ its volcanic cinder, partially collapsed and exposed on the seaward side, gives it an easy name. It’s not just a marker; fishers troll offshore with great success. Nearshore is a marine fisheries management area; you can catch fish for personal consumption, but there is no aquarium fish collection permitted. The hill is actually named Puʻu ʻOhau (hill of dew) and is the most conspicuous coastal landmark on the low coastal cliffs between Keauhou Bay (to the north) and Kealakekua (on the south;) it marks the boundary between North and South Kona. Although the entire landform may be the “puʻu,” according to McCoy … the archaeological evidence tends to indicate that the area was used for general habitation purposes and was not reserved for only burial or other ritual uses that might be considered exclusionary. This archaeological evidence suggests that there may have been a land use distinction between the flat bench and the steeper slopes of the puʻu although they are part of the same landform. The matter of a burial on the puʻu helps us remember some others. With the recent construction and extension of the Ane Keohokālole Highway from Palani road to Hina Lani, many in West Hawaii (although they generally reference the road as “Ane K”) are becoming more familiar with the name Keohokālole. Analeʻa, Ane or Annie Keohokālole was a Hawaiian chiefess; she was born at Kailua-Kona, Hawaiʻi in 1816. Through her father, she was descended from Kameʻeiamoku and Keaweaheulu, two of the four Kona Uncles that supported Kamehameha I. Her first marriage was to John Adams Kuakini; they had no children. Kuakini was an important adviser to Kamehameha I in the early stages of the Kingdom of Hawai‘i. When the Kingdom’s central government moved to Lāhainā in 1820, Kuakini’s influence expanded on Hawaiʻi Island, with his appointment as the Royal Governor of Hawaiʻi Island, serving from 1820 until his death in 1844. During his tenure, Kuakini built some of the historical sites that dominate Kailua today. The Great Wall of Kuakini, probably a major enhancement of an earlier wall, was one of these. The Great Wall of Kuakini extends in a north-south direction for approximately 6 miles from Kailua to near Keauhou, and is generally 4 to 6-feet high and 4-feet wide;’ the Great Wall of Kuakini separated the coastal lands from the inland pasture lands. Speculation has ranged from military/defense to the confinement of grazing animals; however, most seem to agree it served as a cattle wall, keeping the troublesome cattle from wandering through the fields and houses of Kailua. Kuakini also built Huliheʻe Palace; it was completed in 1838, a year after the completion of Mokuʻaikaua Church (Lit., section won (during) war,) the first stone church on the Island of Hawaiʻi. OK, back to Caesar and Analeʻa – they had several children. Most notable were a son, who on February 13, 1874 became King Kalākaua, and a daughter, who on January 29, 1891 became Queen Liliʻuokalani – the Kalākaua Dynasty that ruled Hawaiʻi from 1874 to 1893. Oh, the burial at Puʻu ʻOhau? Ane Keohokālole’s mother, Kamaeokalani (Kamae) is buried at its top. When I was at DLNR, the matter of dealing with the burial came up within the first few days of my term (in 2003.) Back in 1999, members of the ʻOhana Keohokālole requested that protective measures be put in place on the puʻu. The matter was on the Hawaiʻi Island Burial Council’s agenda; the family’s suggested means of protection is the construction of a six (6) foot rock wall around Puʻu ʻOhau. After talking with family members, it was decided to order the wall to be placed on the 120-foot contour. 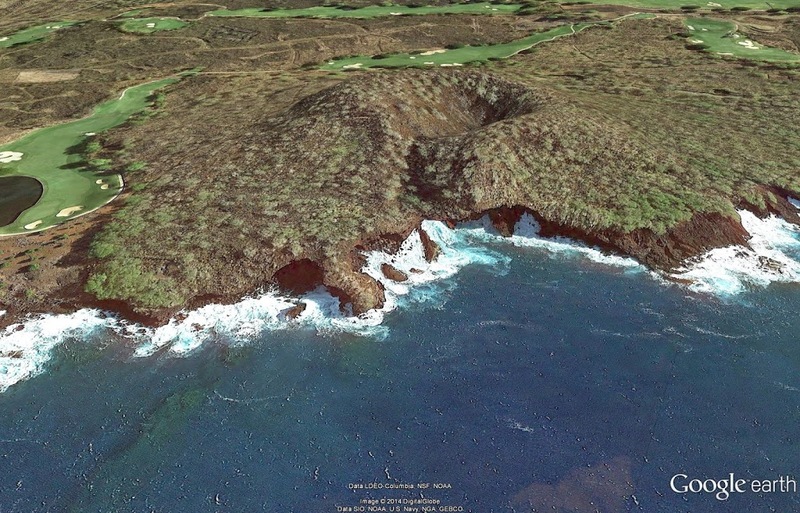 The image shows Puʻu ʻOhau (Google Earth.) In addition, I have added other images in a folder of like name in the Photos section on my Facebook and Google+ pages. “The natives now collected in vast numbers along the shore, and began to throng round captain Cook”. Shortly after, “Captain Cook, the last time he was seen distinctly, was standing at the water’s edge”. His chance came in February 1811, when John Jacob Astor’s ‘Tonquin,’ under the command of Captain Jonathan Thorne, called. The captain wanted to hire twenty-four of the Islanders, twelve as seamen and the remaining half to establish a post for the Pacific Fur Company on the Columbia River. The Tonquin reached the mouth of the Columbia in March; after a few days looking, they selected a site and by the end of May they had completed Fort Astoria. It was the first American-owned settlement on the Pacific coast of what was to become the United States. Astor planned the post to grow into a permanent settlement, with plans to develop a large trade ring that included New York, the Pacific Coast, Russian Alaska, Hawaiʻi and China. The furs collected in the northwest and Alaska, would be shipped to China and exchanged for porcelain, silk and other cloth, and spices that would be brought back, via Hawaii to New York. Other operators had other posts. In the summer of 1810, Jacques-Raphaël Finlay (Jaco Finley) of the North West Company built Spokane House at the junction of the Spokane and Little Spokane rivers. Shortly after arriving in the northwest, Coxe started working for Canadian David Thompson of the North West Company. Coxe later spent the winter of 1811-1812 at Spokane House with Finlay. On those expeditions, Coxe became the first Hawaiian to visit the inland Northwest. By 1813, Fort Astoria and all other assets in the area were sold to the North West Company – they renamed it Fort George. Coxe continued to work there until August, 1814, when all of the Hawaiians at Fort George were sent back to the Islands. After he returned to Honolulu in 1815, Coxe probably reverted to his native name, Naukane. He was well received by Kamehameha. Naukane’s expeditions did not end on the American continent. Because of his familiarity with western ways (with travels to America, Europe & South America) and his personal ties, when Liholiho departed on November 27, 1823 to England aboard the L’Aigle to discuss the future of his Islands with George IV, Naukane accompanied the King. The King Kamehameha II and Queen Kamāmalu died of measles in July 1824; apparently Naukane’s travels had built up his immunity, for he was hardly bothered by measles. King George IV held an audience for the remaining Hawaiians at Windsor Castle on September 11; Coxe was present. The bodies of Liholiho and his queen were returned to Hawaii aboard the frigate Blonde captained by Lord Byron. The image shows Naukane. In addition, I have added other images in a folder of like name in the Photos section on my Facebook and Google+ pages.